Quentin Tarantino’s Django Unchained is now officially his highest grossing film domestically, as the best picture contender has brought in $130 million and counting. Tarantino’s previous best, Inglorious Basterds, still has the higher world-wide figure, but Django Unchained has yet to make a big push overseas. Inglorious Basterds brought in a total of $321.5 million world-wide, with $120 million of that coming domestically. It’s safe to say that once a push is made overseas, the film will do quite well considering the fan and critical acclaim it has received in the U.S. Sony has international duties for Django Unchained, while The Weinstein Co. handled the domestic release. The controversy surrounding the film has certainly helped its figures. Spike Lee has repeatedly blasted Tarantino, but this film has caused him to be especially vocal about, what is in his eyes, the overuse of the N-word and the reduction of slavery to a spaghetti western. However, many others, including Jesse Jackson, are praising the film for showing the struggles of slaves and everyone of African descent at the time, and for bringing one of America’s lowest moments onto the big screen. Regardless of your stance, when a film polarizes audiences enough that they discuss it at great lengths, it’s going to cause people to rush to the theater in droves. Django Unchained has also started the award season well with Tarantino already winning the Golden Globe for best screenplay and Christoph Waltz winning best supporting actor in a drama. The film is nominated for five Academy Awards too including the big prize, best picture. Tarantino’s latest is definitely an excellent piece of filmmaking and is very deserving of the acclaim it’s received, both in terms of awards and box office figures. Considering the story is so focused on American history, it’ll be interesting to see just how well it does internationally. While Basterds obviously had much more of an international audience due to its subject matter, Django Unchained should do well worldwide if for no other reason than how controversial it is. 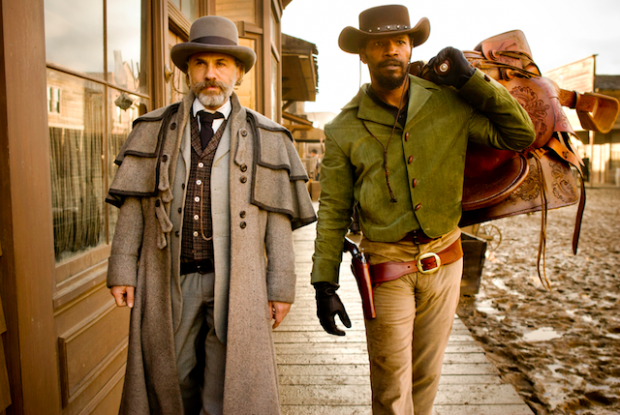 What do you think of Django Unchained‘s chances for best picture? Do you think it’s Tarantino’s best work? Share your thoughts in the comment section below.